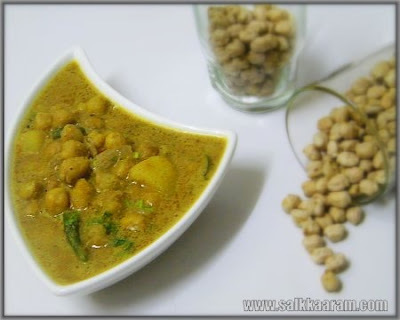 Chickpeas Kurma | Simple and Delicious ! Tired of making regular chickpeas dishes? 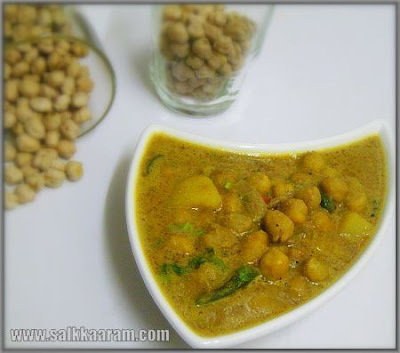 Then add this chickpeas kurma in your dinner menu! This would be a good accompaniment with chappathi, puttu etc..
Cook it in enough water with salt. When half done, add peeled and chopped potato. Roast coconut in 1 tsp oil with fennel seeds until slightly brown. Blend this with soaked cashews and little water. Heat oil in a pan, saute chopped onion until transparent. Fry garlic-ginger paste along with tomatoes, chopped green chillies, curry leaves and all the powders. Add cooked chickpeas/chana-potato mixture and pour the blended coconut solution also to this. Mix well adding enough salt and allow to boil. Sprinkle chopped coriander leaves over this and serve with chapathi, porotta etc. very nice, will make again and again.